In early February 2017, Cisco announced their 2.0 release of HyperFlex. The noticeable innovations are the introduction of All Flash HX nodes with 3rd generation UCS Fabric networking, as well as even better support for data and I/O intensive applications. These innovations already enhance the existing flexible and modular platform, which combines compute performance nodes, hyper converged storage and networking. But there is more in HX 2.0 than what is mentioned above. Normally you would expect to see our new storage integrations happen at the major release cycle, but not this time! Veeam Availability Suite 9.5 Update 2 will introduce an integration with Cisco HyperFlex. A major highlight here is that this is Veeam’s first integration with any hyper converged system. It’s also worth noting that because it is the first integration for a hyper converged storage system, it’s different than the other Veeam integrations you may be familiar with. The main thing to note is that the HyperFlex integration does not include Veeam Explorer for Storage Snapshots, but it may be added at a later date. Let’s review how this phenomenal technology works with the latest release of Cisco HyperFlex. Backup from Storage Snapshots minimizes the performance impact on production virtual machines (VMs) during their backup window. This integration will allow you to take backups at any time of day, even on the most I/O intensive workloads and will also leverage the agentless application aware backup where required (like Active Directory, Exchange, SharePoint, SQL and Oracle). 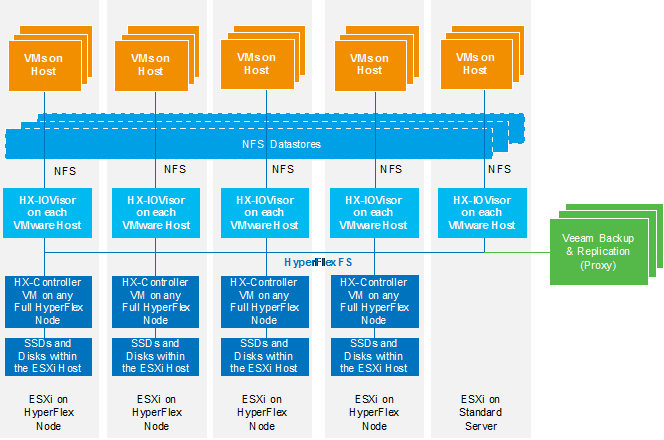 The ability of the Veeam backup proxy to read the data directly from the Cisco HyperFlex VM snapshot over the NFS HyperFlex data network is where the magic happens. This can be achieved in two ways: The data is read over NFS from either the IO Visor (preferred) with optimal data paths or via the HyperFlex Controller Cluster Master. In addition to the optimized way of reading the data, Veeam is still able to leverage VMware Changed Block Tracking (CBT), which keeps incremental backups incredibly fast. The image below shows an example architectural view of how the Veeam proxy is connected with the Cisco HX components. You can leverage Veeam’s VM-level replication between different HyperFlex or other VMware environments. Veeam replication copies data of the original VM running on the source host and creates its full replica on the target host. Unlike backup files, replica virtual disks are stored uncompressed in their native format. All subsequent replication cycles are incremental. Veeam copies only those data blocks that have changed since the last replication job session. This is achieved by leveraging VMware CBT. The replication process can be achieved by using all Veeam transport modes that are available for NFS storage, but the one to highlight here is the fact that the Backup from Storage Snapshots feature can be leveraged in this scenario to better reserve any impact of performance on the production environment. All in all, this allows for a much better Availability experience when working with Backup from Storage Snapshots and the Veeam replication engine between multiple sites. 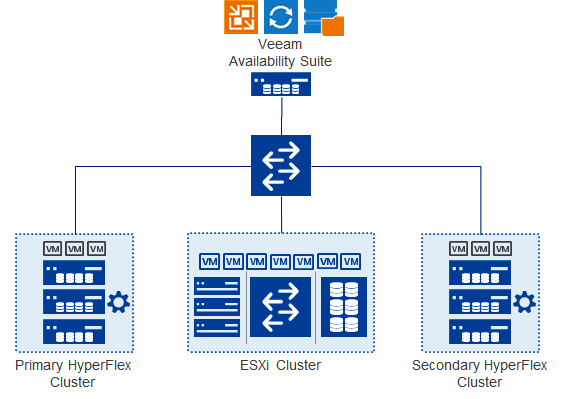 This new Cisco HyperFlex release extends the Availability of the Cisco Data Center portfolio with Veeam. The use case for the Cisco HyperFlex offering is broad, covering main data center workloads, as well as remote and branch office locations. 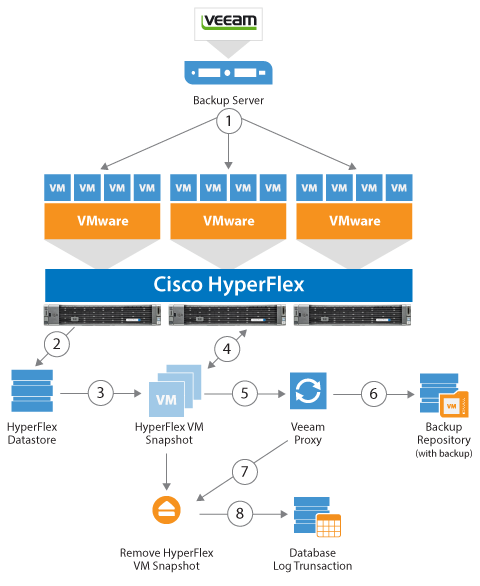 Veeam Backup & Replication 9.5 Update 2 will bring more efficient Availability to Cisco HyperFlex 2.0 by providing both an optimized backup and replication workflow to lower the recovery time and point objectives (RTPO) to less than 15 minutes for all applications and data running on top of it.